There is one post tagged containers. Since containers got traction within the IT community, especially with developers, there have been discussions that it would make virtual machines obsolete. “VMs (and with it hypervisors) are consumers of resources that can be used to run applications” is the general thought that comes to mind when you only take containers into account. Which is true is you are a developer and care about your applications: containers only on bare metal is the way to go! But you do need to take into account that applications need to be maintained and managed by IT infrastructure operations guys. For them it’s about creating a stable environment and making sure that the infrastructure delivers it’s service in a resilient way, while keeping everything manageable. For this reason server virtualization and virtual machines have been a huge success over the last 10 years. It abstracted the compute functionality by creating virtual machines, made infrastructure management easy and optimizes resource management. Now containers come along and all that great features of server virtualization are forgotten and basically Ops is being told: bare metal is the way forward. In my opinion this all comes down to a responsibility definition : Containers solve a Dev problem, virtual machines solve an Ops problem. 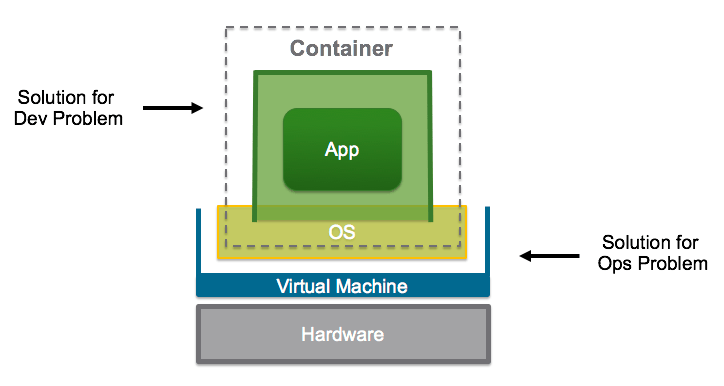 Better yet virtual machines create a foundation for the challenges that containers have. The biggest problem with containers today is that they don’t provide isolation. This has been a feature of VMs since the beginning. So the shortcomings of containers are solved by virtual machines. The picture below give a graphical representation of a container on top of a virtual machine. Don’t get me wrong: I love containers and the problems that they solve for developers, but I don’t think we need to throw away best practices on how to operate an IT infrastructure just because we can. Virtual machines have proven to be a good foundation within IT infrastructures of today and test have already proven that the impact for resources of running containers on top of hypervisors are minimal, even neglectable. So containers on top of virtual machines: the best of both worlds & bringing Dev and Ops closer together.